Black Creek Farm & Feed Supply is a family-owned building supply, feed and lumber yard situated half way between the Courtenay in the Comox Valley and Campbell River, proudly serving Vancouver Island communities since 1983. In the spring of 2015, Black Creek Farm & Feed purchased the assets of North Courtenay Landscape Products, so Black Creek Farm and Feed now offers bulk sales of mulch, topsoil, navi-jack, compost, and sand. They also have a well stocked Garden Centre complete with everything you need for grass and garden care. They also supply hardware, paint, and a variety of fencing and roofing products, too. For any size of building projects, ask Steve Nixon for a "package" quote. Black Creek Farm and Feed also offers delivery services for feed, bedding, and landscape products. Check out the animal care products and feed for a variety of critters--from dogs, cats, and birds, to livestock, horses, and chickens. Budget Blinds carries a variety of window coverings including: blinds, shutters, shades, curtains, drapes and window film. They service the Vancouver Island areas of the Comox Valley, which includes Comox, Courtenay and Cumberland as well as Campbell River, Qualicum, Parksville and Nanaimo. Budget Blinds provides high quality and stylish window coverings and blinds for new homes and home renovations, as well as for commercial, retail and professional offices. Their goal is simple: to provide their customers with the best window coverings and products combined with professional installation services to enrich your home or office environment. To help choose the most suitable window product in the perfect texture and colour, they have two interior designers on staff who will come to your location to help you choose the right window coverings, blinds or shutters for your home or office. Budget Blinds also supplies business owners and property managers a complete turnkey solution for their window covering needs in the areas of Nanaimo, Parksville, Qualicum Beach, the Comox Valley and Campbell River. Commercial window treatments are available motorized, flame retardant, kid friendly, cordless and even energy conserving. Budget Blinds has an entire line of green window coverings that are eco-friendly and made from sustainable materials. They offer very competitive pricing on popular and unique window coverings for commercial and professional buildings. Budget Blinds can customize fit any window covering regardless of the shape of the window. Call them today to schedule your free consultation. They will bring you samples of the highest quality and most fashionable window coverings available. Building Links is the construction newsletter for North Vancouver Island. For nearly 20 years, Building Links has been a recognized and valued resource for readers who receive weekly up-to-date news for the Vancouver Island construction industry. Subscribers to this construction newsletter find new business leads from our updates: reports on tenders; building permits; development permits; and breaking news in the construction industry. Reporting on upcoming new construction is our specialty. Building Links offers the "inside scoop" on development projects from the Comox Valley north, on Vancouver Island. We give you advance notice of large residential projects, and tell you when rezoning, subdivision and development permit applications are in process. Sign up now for your 4 free issues! cbsurvey.caChicalo Burridge Land Surveying & Geomatics Ltd.
Chicalo Burridge Land Surveying and Geomatics Ltd. was established in 2001 when Colin Burridge purchased the firm of Chicalo Young Land Surveying Ltd. which he then integrated with his existing consulting firm based in Courtenay. Professional surveying services provided include land surveying and geomatics engineering. Professional accreditations include: Professional Engineer with APEGBC, Member in Good Standing with Association of BC Land Surveyors, Member and holds license to practice with the Association of Canada Lands Surveyors, Member of Canadian Institute of Geomatics and Registered and certified as a SAFE company with BC Forest Safety Council. Colin Burridge Land Surveying and Geomatics Ltd. has a relocated to a new office at 1250 Unit E - Cedar Street, Campbell River. Types of services offered include: Legal surveys for subdivision and strata developments, easements, right of ways, covenants, re-establishing lot corner pins, topographic surveys to support architectural design for new construction, lay out surveys for new construction and engineering infrastructure, building location certificates to support real estate transactions and municipal requirements, ALTA/ACSM surveys for American clients, GPS surveys for mapping projects and hydrographic surveys to support marina design. Consulting services are also offered for Agricultural Land Reserve, re-zoning, subdivision and Crown Land tenure applications. The firm is also licensed to perform Canada Land Surveys on First Nations Lands. Chicalo Burridge Land Surveying and Geomatics Ltd. provide services throughout Vancouver Island the Gulf Islands and mainland British Columbia. The bulk of operations are performed in the Campbell River area, Comox Valley, Courtenay, Sayward, Quadra and Cortes Islands. “Working for you in one form or another,” Comox Valley Island Forms Ltd specializes in concrete form rentals for builders and contractors on Vancouver Island. Comox Valley Island Forms also offers truck and crane services and sells concrete supplies and accessories. Clients ranging from residential developers to self-contracting home owners throughout Vancouver Island have been turning to Comox Valley Island Forms since the 1980s for their concrete forms and more. Delaney Relocation Services makes packing, moving and settling into a new home easy. They have been in the business of helping people pack, move and relocate for the past 10 years. The company has expanded and now serving Campbell River. Delaney Relocation Services has a team of caring and experienced professionals to help with packing, moving and setting up your new home – from kitchen cupboards to home electronics. The company is a member of the National Association of Senior Move Managers and of Professional Organizers in Canada. Working from Campbell River to the Parksville and Qualicum areas they provide top quality care throughout a move. Delaney Relocation Services has also teamed up with the Casa Loma seniors' facility to help new residents move in. Call today for a free one-hour consultation and written estimate. Compare Delaney's rates to traditional movers and see how much you can save. Discover how easy packing and moving can be! , and start planning your move in Campbell River, Parksville, Qualicum and the Comox Valley. Down to Earth Stone Slinging can load dirt, sand, top soil, sea soil, pea gravel, drain rock and fisheries rock and more. They truck it in and they spread it out! Based on Vancouver Island, Down to Earth Stone Slinging uses a stone slinger truck to place sand, gravel, pit run and landscaping material accurately and precisely. Down To Earth Stone Slinging’s system is designed to eliminate hours of manual labour while placing sand, topsoil, drain rock for perimeter drains, for back filling crawl spaces and garages and placing blue chip on driveways. Their trucks can haul 10 to 12 yards of material at a time and can place material from 0 feet to 120 feet with a conveyor belt system, which has a 270 degree working radius. Down to Earth Stone Slinging Ltd. is now doing business under Five Star Aggregate & Excavating Ltd. 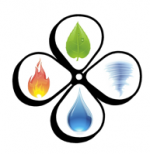 The company offers landscaping supplies and servicing, as well as excavation, trucking, septic design and installation. 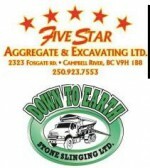 Five Star Aggregate & Excavating Ltd. and Down to Earth Stone Slinging serve residential and commercial customers, including contractors and home owners on north Vancouver Island, Courtenay and Campbell River. They look forward to providing you with the same Five Star Service! United Floors in Courtenay and Campbell River offer a wide selection of new flooring to suit any need. United Floor's new flooring products include carpet, vinyl, laminate, hardwood, cork, ceramic, and area rugs. United Floors in Campbell River also offers blinds and custom draperies. United Floor's experienced sales associates help clients choose the best new flooring or window coverings for their home. Visit the United Floors website for an online quote or call for a free in-home measure. United Floors also offers comprehensive information on installation, stain removal, and maintenance, in store or online. United Floors in the Comox Valley and Campbell River offer service and selection that are second to none. Drop in today to view their extensive showroom. follow United Floors on Facebook for updates and special events.